As I have mentioned before, (several times in fact), I am here and blogging, thanks to bloggers such as Crystal Paine. I have always been a frugal person, a couponaholic, and a deal hunter, but a few years ago when a medical catastrophe hit me, I was forced to figure out more ways to save and earn money. I was never a huge fan of computers, and the internet. I am still pretty old fashioned, I like books, board games, and I like for my children to know what an encyclopedia and a dictionary and actual books are like! But, we purchased a computer and I decided to put it to work! One of the first newsletters I had signed up with, was The Money Saving Mom Newsletter, and I was happy to get some tips and links and help with the online shopping and bargain hunting world. I was so happy to hear about her book deal, and was anxious to read her book when it came out. Her book is actually being released in January of 2012. I received her book about a month ago, and was very excited to be asked to do a review on her book!! This was honestly something I didn't expect, as I am still fairly new and only run 2 blogs for now with a little over 100 followers between the 2! But, we all have to start somewhere. I read the book in just a few days, and I was pleased with the way it was written. She keeps your attention on each page, and has her own way of writing, which is very pleasant, positive, friendly, and gives you something to smile about. This is an excellent starter book for anybody who has recently lost a job, has been going through rough times, or just wants to learn how and what they can do to become more self sufficient and save where ever they can for their families! Crystal covers mostly everything in this book, and I was happy to see that there really wasn't anything left out. All of the tips and advice were well written, and I appreciate her writing this book to help others out. I am also relieved that Crystal covers couponing, the truthful way! 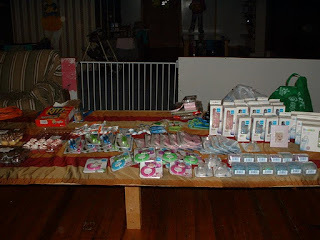 This is something I have been doing for so many years, and to have certain tv shows, and bloggers and Facebook pages, come out with some ridiculous, far fetched, crazy, unbelievable, coupon strategies, and stockpiling maniacs, made to depict all couponers, and frugal moms, as some loopy, hoarding, monsters, I was very much appreciative when I read her book! But Crystal, thank goodness, gives a very real depiction of couponing, what it's about, how to do it, and even covers the ever so hard question to answer for people, "How do I save without coupons?" From tips and pointers about savings, and NOT using the ever loved, American way, lol, credit card, and swiping everywhere you go, to personal empowerment, cash only challenges, to how to give and donate, no matter your income, her book covers it all! I guarantee it is well worth your while, even if you are an avid saver, and couponer, It is an enjoyable read, and I love knowing that it was written by somebody who has been through rough times just like my family. Who better to get your shopping tips and saving and budget advice from, then another busy mommy who wants to instill good values in her children, and is always looking for ways to save as much as possible in every aspect? PS) I may be having a giveaway for a copy of The Money Saving Mom's Budget, very soon! 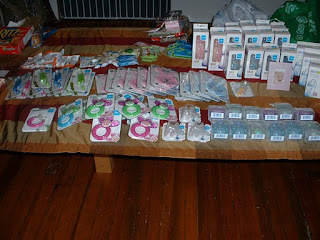 Keep reading this blog and my other blog, http://www.momscrazyday.com/, for info on when this giveaway will start!! I recently started selling Enchanted Potions products, and I will be doing an order this week, so I can offer gift baskets and gift ideas on Ebay, here, and Facebook. I am super happy with their products! I have used the lip balms, lotions, shower gel, and shampoo. My 4 year old absolutely loves the bubble gum scented detangling spray I specially ordered! Deegan, and even the other 2 kids, lol, love the fun smelling bath confetti! Plus, they come in adorable little shapes, we have fish and ducks. The little envelopes are so cute, and they last a few baths, depending on how many your kids beg and scream for! Mine all ask for more since they dissolve in the bath water, lol. This company is very unique, and I am thrilled to be a direct seller for them! I can't wait to start making gift baskets, and posting the pictures and scents. 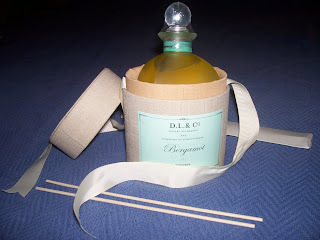 The best part of this company, is that you can customize your orders, with your choice of scents! They offer a great list, anything from, toasted marshmallow, to bubble gum to candy corn, to sweet pea! Almost every product they offer, is able to be customized with your choice of very good smelling scents! I love the lip balm, I have a heavy addiction to lip glosses and lip balms and even if it is not pink, (my usual favorite choice), I don't leave the house without it! It works great against chapped lips, and I am happy I ordered 2, since Genevive also loves it, and lip glosses and lip balms have a tendency to get lost around here lol! I also am falling in love with the chocolate scented shower gel! I pair that up with my toasted marshmellow body lotion, yum! Anyway, I am offering a free gift with any orders over $50 right now, and 2 free gifts with any order over $75!! You can order through me, busymommylist@yahoo.com, or you can order direct from the website. If you order from the website directly, please remember to put my name, Brandy Oliver, as the sales rep! I will be able to see who ordered and you can email me directly to let me know that you did this, that way, I can ask for your address, and send your free Enchanted Potions products! Now, let me tell you about the fantastic Enchanted Potions Giveaway!!! The only requirements for this giveaway are to subscribe to my RSS feed! You have 2 opportunities to enter this way! The first being this blog, http://www.busymommylist.com/, and the second will be to subscribe to my RSS feed at http://www.momscrazyday.com/! It's very simple! I will then, go through the emails that are subscribed, and through http://www.random.org/, pick an email, and you will win a $25 Enchanted Potions store credit!! You can order direct through me, and the $25 will be taken off of your order!! There is one more thing that you may find a little annoying that I would like to explain. Enchanted Potions makes all of their products, to order. There aren't any shelves or warehouses, filled with products, because, when you place your order, they start from scratch! Wow!! I know, it is a bit long, (usually a 3 week wait), to receive your order, but I guarantee it is well worth the wait! I also love the fact that they made it special, just for me, after I placed the order! Lotions and shampoos, do have a shelf life, and there are times I wonder how long things have been sitting around when I shop. I do not have to worry about that with these products!! If you have any questions, comments, or would like to order, or if you would like to start selling Enchanted Potions products, you can email me at busymommylist@yahoo.com, or comment here!! I would also always be interested in doing giveaways with sponsors, to help promote your products and blogs or business! AND always feel free to contact me in case you are in need of a sponsor for a giveaway as well! I sell Enchanted Potions, and Gold Canyon Candles, and RADA. RADA is an ongoing fundraiser I do for RSD, a medical condition I suffer from. If any of these would help your site, and you would like to offer any of my products, please let me know! I am hoping to have a much more established networking type "business", in the near future when I have bigger numbers, and sponsoring giveaways will always be something I do! Connie Won the My Memories Suite Scrapbook Software Giveaway!! First, let me explain the creation above, lol. My oldest daughter, Bethany, has this drummer boyfriend, Andrew, who is pictured above. 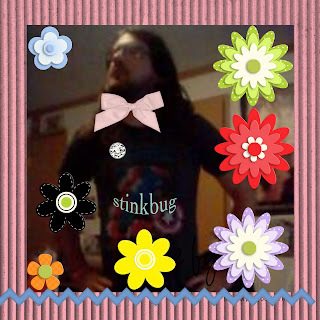 Well, Genevive, my 4 year old, decided it would be much fun to make Andrew look like this with our My Memories Software. (We love this stuff!!) So, this is why there are pretty flowers and colors all around this boyfriend of Genevive's big sister. Anyway, we had 22 entries for this giveaway, and it was posted numerous times, however, only 1 person followed the instructions, and posted at the right spot and was honest in completing all of the tasks involved in the giveaway. Thank goodness we had at least 1, lol. From now on, in all of our giveaways, you have no choice but to follow the rules and guidelines posted. I can't even count your entry, especially if you did not even visit the sponsors page, and you unfollowed my blog or blogs, a day after posting on Facebook or Twitter, that you followed the rules and entered the giveaway! So, thank you Connie!! I appreciate your comment, and the following all of the guidelines!! This means a lot to me, and I am blessed to have you as a blog friend!! Please email me at busymommylist@yahoo.com, with your info, so that I can forward this info to our giveaway sponsor, My Memories! I can also give you the info, if you don't already have it, about the freebies they offer each week!! They have awesome freebie downloads, which are great editions to the software set that Connie just won! I have had nothing but a fun time, and a great experience, with My Memories, Liz, is the sweetest, and I am very grateful that she emailed me a few months back with so many great opportunities! We will be working a lot with My Memories, and I will be posting the freebies they offer, coupon code links for the Scrapbook software, and creations that my kids and I make with the download they generously gave to us to review! I hope you all take advantage of this great companies offers, and the fun times you can have with your children, making such fun creations! I personally recommend this software, and we use this quite a bit. Whether it's just for fun, like the picture above, or we are making cards or photo albums. I haven't figured it all out yet, but with this software kit, you can also make your blog templates, logos, business cards, the list is literally endless, and I am scheduling some extra time in November, to work on a whole series of My Memories creations and posts for you to interact with, and share! I had the pleasure of staying up late one night a few weeks ago, and luckily being on Facebook to update my page, when I noticed a real cool page, CK Bakery Shop. You have got to check this business out! WOW! This business, started out by the owner, baking cakes for her husband and son who were fighting overseas in the war, and sending a little bit of sadly missed home, right to them. Cakes baked in mason jars, and shipped right in a box through the USPS! This idea and business absolutely fascinated me, and I was overwhelmed with joy, knowing that there are so many amazing people out there in the world. What a brilliant idea I thought, and I noticed she was offering deals and specials, and I knew i had to try these cakes out right away!! You have to see the amazing list of flavors and varieties she has available! I just think this is the sweetest idea! CK Bakery Shop's cakes in a jar, would be an excellent gift for college students, soldiers, elderly friends or family, disabled family members, and friends, anybody who could use a good pick me up and a reminder that someone is thinking about them! CK Bakery Shop runs a very active and fun Facebook page, head on over and tell them Busymommylist sent you!! When you get there, you can check her list of flavors, and prices, and the prices are very reasonable, not to mention she runs extra awesome deals and promotions! All of the cakes were just like homemade, and were adorable in the little mini mason jars! the package we received, was a $15 mini cake sampler, which includes 6 flavors of your choice, and includes shipping costs!!! Please check out CK Bakery Shop's Facebook page, and place an order asap!! You can check here for a dealer near you to help you find the best vehicle, van or modification for you or your loved ones! They offer "in person" personalized evaluations, to fit you in the best quality vehicle, whether new or used! You can even opt to have your own van or vehicle modified! Sometimes, in an elderly person, or a disabled persons life, having a vehicle of their own would be a great help, and offer independence that didn't seem available before. NMEDA is a non profit organization, and they do not sell anything! Who better to serve you then this? They are looking out for you, and they will help you choose the best quality dealer or QAP dealer close to you! I personally would not settle for any internet or mail order companies for such an important part of disabled and elderly care as this. I am happy that this service exists, and seems to have a very extentsive network of dealers and QAP dealers around! QAP is a quality assurance program, they are the only nationally recognized accreditation for the Adaptive Mobility Equipment Industry. QAP is based on the principle, that in order to satisfy customers consistently, companies must have a systematic and documented approach to qualify. Did you check your zip code? Are you or a loved one in need of a service such as this? I know that we all know or will know, or will be, in need of a service and support such as this, and what an amazing group NMEDA is! Keep them in mind for anybody you may know in need of assistance, or for the future! I am happy with my research on this non profit organization, and think a lot of us would benefit from a service such as this! We had a very fun time with our mom group and our MAM party, the last 2 weeks. MAM sent a ginormous box of free products, coupons, brochures, and real cool prizes for our games! I personally have heard of MAM, and I have seen their products online and in Parenting Magazine, but I have never come across them in a store. (We live in a very rural area, and we aren't near lots of big stores) Although we do get out in the "big city" sometimes, lol, I am a little limited to where we go shopping. I am very impressed with the bottles and the cool designs and the shape! My little guy, Deegan, was quite impressed with the blue toothbrushes the most. He is 1 now, and amazingly enough, he loves brushing his teeth! ( I wish I could say that about my 8 year old son, lol). These products are superior quality, and I am very pleased with all the teething rings, which by the way, have the coolest and smartest design I have ever seen on a teething ring yet! How cool is that, to have the teething ring actually have parts to fit the whole way in the back for those sore parts? 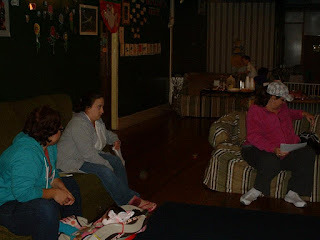 We had our first party on October 1st, and I actually forget my ancient digital camera. I only realized this on the way to our party, and luckily, the daycare owner who offers her daycare for our meetings, had a camera to take pictures for our posts! 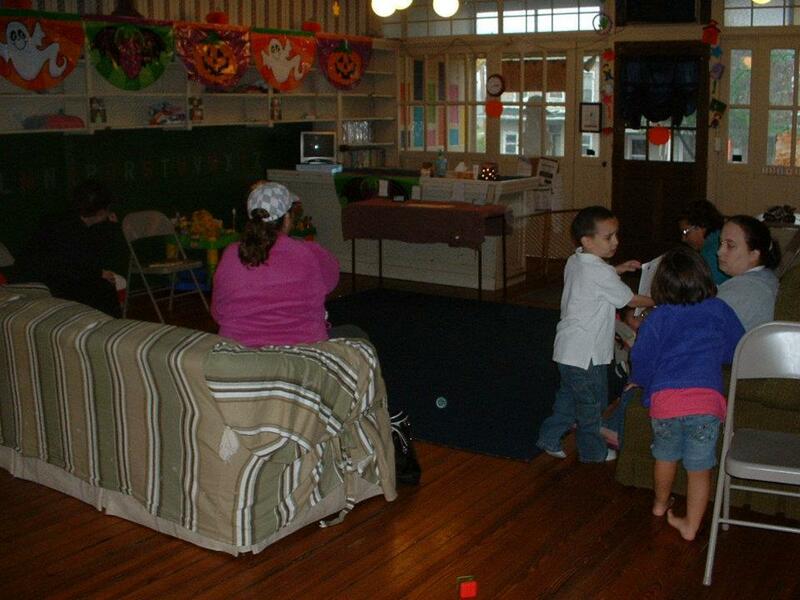 We had a mix of pregnant moms, pregnant first time moms, and babies and a few toddlers. The snacks went over quite well, especially with the little ones! We had cheese and crackers, a fruit tray with dip, (yum!! ), goldfish crackers, tea and lemonade and a few different kinds of mini cupcakes! It was such a nice time, and I love being able to help people and have such cool treats and gifts to give away to friends! We have so many moms and even not moms, lol, interested in our group, and hoping to attend our November 5th meeting. We already have a couple meetings per month, due to locations of some of our members. I live in the middle, so I have some over at my place once per month, and I travel about 20 miles to another town, to have the other meetings! We were all very thankful and excited for this MAM event, and I am anxious for our next meetings we have coming up!! We also still have a few MAM products left, and I think we will have those for new members, who are expecting or have little ones. We also have a project we are doing with our "Not Just 4 Moms" group, with donations. (a member came up with this real cool name at our MAM party!!) 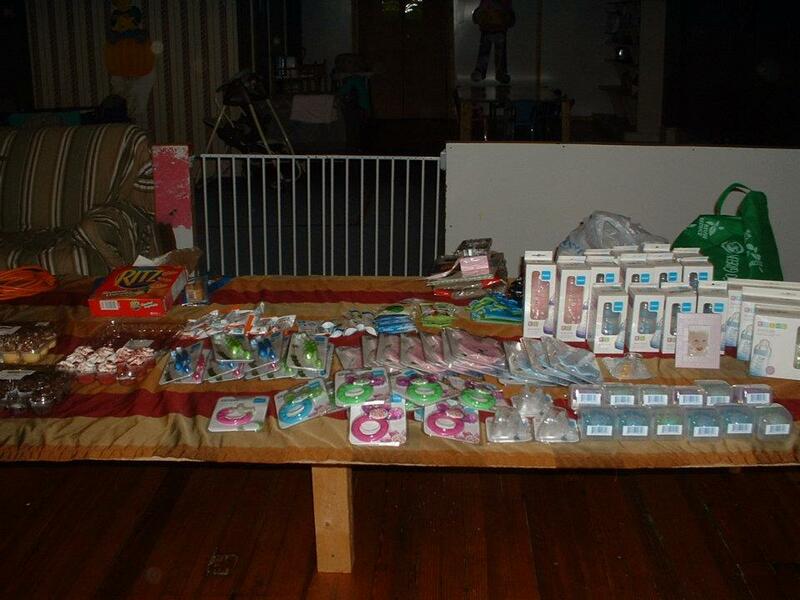 So, I believe we will be figuring out exactly which church or school will be receiving our donations, and then we can decide if we should donate the leftover pacifiers, and teething rings! That may be a very nice gift for someone else! We have a "Reviews" tab on our groups brand new site, and MAM is the first review on our site!! 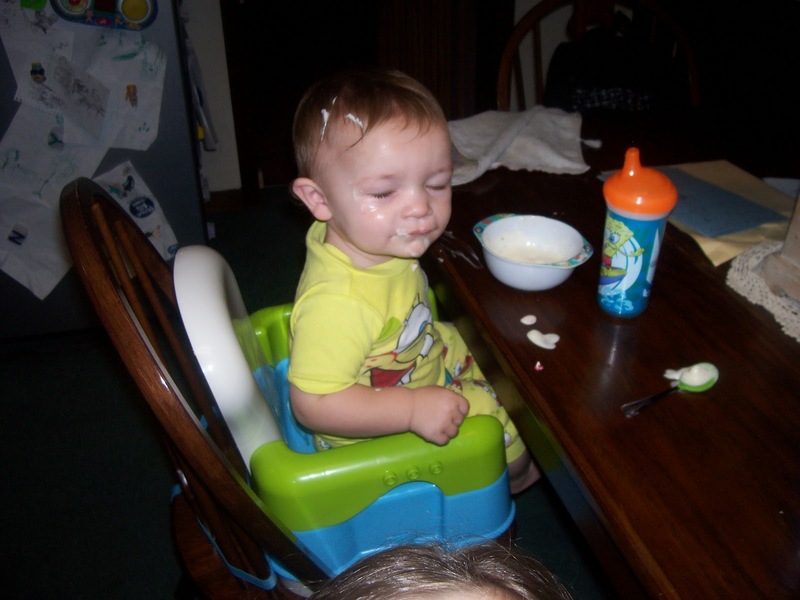 I will have another post on my other blog, momscrazyday, with some real cute pictures of Deegan, using his new favorite toothbrush. I have to run for some batteries for the camera, and upload the pictures! We had a very nice time, everybody in our group seemed to really be happy with the products they received, and we all seemed to think MAM products are very high quality, and have awesome designs and the biter brush I believe was the biggest hit! I am shocked that I have never seen this product before! After 4 kids, and now unfortunately we are done, (sometimes I wish we weren't;p), but after all of that, and now I find a biter brush!! I think I know what our next giveaway should be..... I think a MAM gift basket with a biter brush and the awesome glow in the dark pacifiers, will be a huge success!! At least I also know what to purchase for baby shower gifts in the future. I am more then pleased with MAM, and I am very grateful for the nice box they sent for our party, filled to the top, with tons of cute gifts and products for everybody! Outstanding job MAM!! Thank you! Child's Play Party, is an amazing company! I have so much fun with the opportunities they provide for these parties! I recommend them to anybody who has a mom group, blog, website, or even a product they would like to get out and advertised. Not just 4 Moms, and me and Deegan, give MAM, and Child's Play Party, 5 stars!! The kids and I are very proud of our gardens this year! We planted a lot of things, flowers, fruits, veggies, and herbs. We just grabbed a bunch of mismatched seeds and planted them, and waited to see what was coming. Most of our garden was a surprise, lol, we had no clue what to expect. With the exception of the cherry tomatoes, spring onions, pumpkins (that never came, but still took over most of the fruit and veggie garden! ), cucumbers, and all kinds of peppers, we were having a fun time checking our garden each morning to see what was coming next! We did plant lots of onions, and we did not see any, as the cucumbers, watermelon, and the fabulous pumpkins, took over and stole the sun away from the entire middle of our garden. This was a shame, because I cook a lot, and I use lots of onions! But we learned some things about these plants, and we also have to make our garden bigger for next year. These flowers, especially the orange ones, are also surprises. If anybody knows what any of these gorgeous flowers are, please comment! I really need to know what to purchase for next year, and I would love to read up on them so I know exactly how to take care of them! Sunflowers are my very favorites, I am saving pictures of those for their own, special, My Memories creation. We had a lot of luck with those this year, thank goodness! Every time I see a sunflower, it brightens my day! Ever since I was a little girl. I really am having a super fun time with this software. i am actually amazed with how quick I can create pages, and I will be attempting business cards next. I was also thinking about making a logo, or a button for a blog I have, and installing that as well. I know for sure, the kids and I will be making plenty of Christmas cards with this software in the coming months! So, maybe you read my previous post, or read my Facebook announcements about this generous $10 off coupon code that I am excited to share with my friends! (You can find the links and code in the post directly underneath this one, or if I post to many creations, lol, I guess I will link the post here for you to find it easier!) Did you read about the giveaway??? My Memories, is sponsoring a giveaway for my friends, and the winner will receive a free My Memories Suite download! (a $39.97 value!!). I promise you, you will not be disappointed in this awesome software!! Not to mention the real cool deals that http://www.mymemories.com/ has every day, freebies, dollar store, Design Club, lots of goodies! Well, let's get to the giveaway rules!! 5) Sign up for the Mymemories newsletter! The Following are optional entries! 1) Refer friends to this giveaway and ask them to comment on one of the giveaway posts with your name1 This will get you 1 entry! 2) Follow me on momscrazyday! 3) Follow the Mymemories blog! This giveaway is in no way affiliated with Facebook! The winner will be announced on October 26th of 2011. The winner will be notified by email, and will have 48 hours to reply with your info, and the code for your free download will be delivered to you asap! if you are already a follower, just let us know in your comment on one of the giveaway blog posts, all of your current activity is still registered and will still qualify for entries! If the winner does not respond by email within 48 hours of the announcement, another winner will be picked! No exceptions!! My Memories Suite Scrapbook Software Review and Giveaway! This software I was so generously given an opportunity to review, is so much fun to create things with! 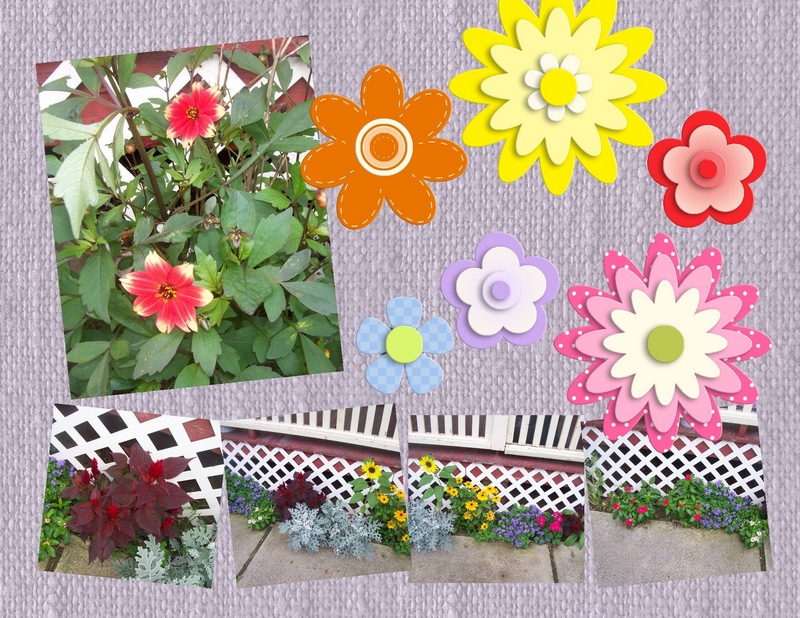 I have never been much of a scrapbooker, but I am addicted to this software and I found that it is not just for scrapbooking! I have since signed up for the newsletter, from http://www.mymemories.com, and they have very cool deals and specials, included some free downloads. I was having a hard time getting this download and starting this new hobby, due to printer issues, and ink problems, and I am finally able to print all of our creations. ( The kids are super happy about this!). I have only recently started blogging, and learning all I can about computers, blogging, and everything in between. I have to say, it has been an adventure! I pick new goals each week, and each day, and it is quite fulfilling when I can cross something off my list. For being fairly new and trying to teach myself so many things, this My Memories Suite Scrapbook Software, was a blessing! It was so simple to install, and start the whole process, not to mention how simple it is to start creating your pages, pictures, cards, practically anything you want! 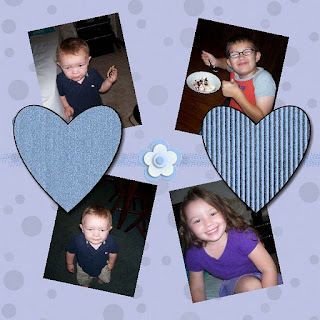 (I just recently started learning how to mess with pictures, edit, cropping, etc, with our caveman years digital camera, lol), so i was shocked at how easy this was to place the pictures right where I want them. The variety of layouts, and templates, will keep you occupied and allow for many, many, scrapbooks pages or virtually anything you can think of! I have come across some very adorable blog templates and buttons, made from this software, so that is something I am attempting next! I have been reading blogs that I have found through Mymemories on Facebook, and they are some of the prettiest, and coolest designs I have seen! This is something every mom, grandma, dad, blogger, crafter, business, anybody, should have! There is so much you can do with this, and the price is just right. $39.97 for the complete My Memories Suite Scrapbook Software, is a nice price! They also offer backup, and updated versions as well, for a very low price. I was given a coupon code you can use, to receive $10 off the final price of your order!! This can be placed directly in the coupon code box at checkout! You can click here to purchase the software and when you get to the checkout process, (You should check out the other kits they offer! There is a "free kits" tab at the top of the page!! ), you can enter this coupon code, STMMMS10452, for $10 off of your order! (This code is only for the My Memories Suite v2, but this software will start you out on tons and tons of options for creating so many things! While you are grabbing this software, you have to check out all of their deals! They have freebies, like I mentioned before, and dollar deals, digital scrapbooking kits, very gorgeous album templates, and a Design Club! The Design Club is $5.99 per month and you can cancel at any time, (although I doubt you will want too) because they will give you 5 exclusive new kits, each month! You also get access to the new designs, a month before everybody else! You also will receive specials, promos, extra super deals for Design Club members, AND the best part, (ok, one of the best parts, because the 5 exclusive new kits each month is very cool! ), is you will receive a 5% discount for every 6 consecutive months that you stay in the Design Club! (up to 20%!!). That discount applies to anything in their store, and is stackable with other deals and promotional discounts. I am very impressed with that deal, compared to other "clubs', i have never come across such awesome benefits! Back to my review of this real amazing download! I am just amazed at the amount of designs, colors, shapes, templates, textures, shadows, all kinds of extras in this software download, that is very simple to put together, and looks wonderful! The picture at the top of this post, is the very first page I created with My Memories Suite Scrapbook Software. I am so happy and shocked that I was able to do this, and I am spending the rest of our rainy day, creating more pages! On top of all of the real cool and cute flowers, and ribbons, and shapes, the parts I am in love with are the textures! The shadowing tool is very neat too! I just think this is super cool! I love how it adds dimension to the pages! You have to look at all of the embellishments there is! I am just so thrilled to have this, and i keep coming up with new ideas for gifts and pages. There are many options to share your creations, you can print your own creations, or have them professionally made into a book, (or books). you can order as many of these hard bound books as you would like. An excellent idea for relations for the holidays! You can also choose to have a DVD made, or view on your iPod. There is also a way to make your scrapbook interactive, and you can send to long distance friends and family. They can play video, and you can embed files, and share links. You can make calendars, cards, trading cards for your children's sports teams, make posters, and videos to share with family! You have to check out their website, and see for yourself, all of the designs, templates, kits and options you will have with www.mymemories.com! Think of all of the money saved making your own greeting cards and calendars!! Don't forget, if you go here and enter the coupon code, you will receive $10 off!http://www.mymemories.com/digital_scrapbooking_software (making this software, the final price of $29.97!) The holidays are coming up and this would also be a great gift for family and friends! Whether you are making the creations as gifts or purchasing the software for them, it is the perfect, and a very thoughtful gift. I will be making another post today, as Mymemories, is sponsoring a giveaway for my readers! YAY!! The giveaway winner will receive a promo code, to install the My Memories Suite Scrapbook Software for FREE! Check my blogs, and Facebook in the next 24 hours, for this giveaway to be officially announced! I have used Vistaprint a lot in the past, and I plan on buying from them a lot in the future! I love the quality of their business cards, even when they are free! I normally don't pay very much at all for them, just a few bucks to get a link and picture on the back of the card. I do love the address labels too! I am grabbing some of these while they are on special again, and I believe I'll be using them for Christmas gift labels. You can choose from over 7000 designs, and there are virtually hundreds of color schemes, designs, images, and themes! Other cool things to use these for, are for toy labels, tote labels, toy bin labels, gift tags for all occasions, envelope sealers, and Christmas gift tags, well, and address labels of course! You will be charged for shipping, which is mostly only between $3 and $4, depending on where you live. You can also check out all of the other freebies Vistaprint offers, and either order those with your address labels, or wait for another day! I made the coolest business cards here, and they even let you upload your own logos!! You can check out all of vistaprints awesome deals and freebies by clicking here!! Deegan loves this flavor the best. He also likes to wear it, lol, and lick it off his arms. No, I don't let this happen very often, and ice cream is only a once in a week treat for us. Usually on the weekends. But the brand and flavor we buy the most, is Edy's Fun Flavors Nestle Toll House Cookie Dough Ice Cream! We have tried many, many, many brands, and this has won all of the kids, and my husband's, votes by a landslide! Aaron is giving his review of Edy's ice cream. he likes to add Hershey's Syrup and lots of extra sprinkles. 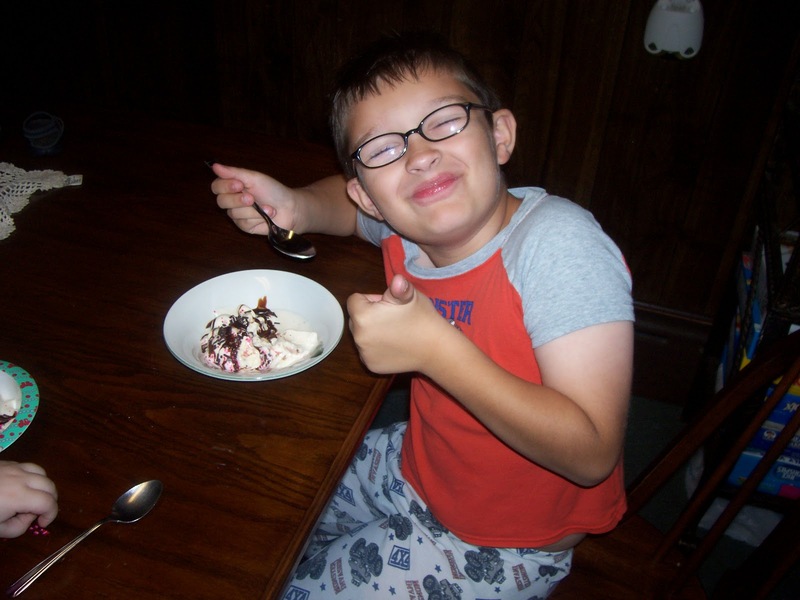 his favorite is the creamy vanilla part, he says, and he loves the chunks of cookie dough that surprise him in his bites! Lol! He is a hard one to please, very picky and this is the ice cream he prefers over all the rest! Genevive also is a big fan of this brand and flavor. She likes to add heart sprinkles and chocolate sprinkles, and nonperils! 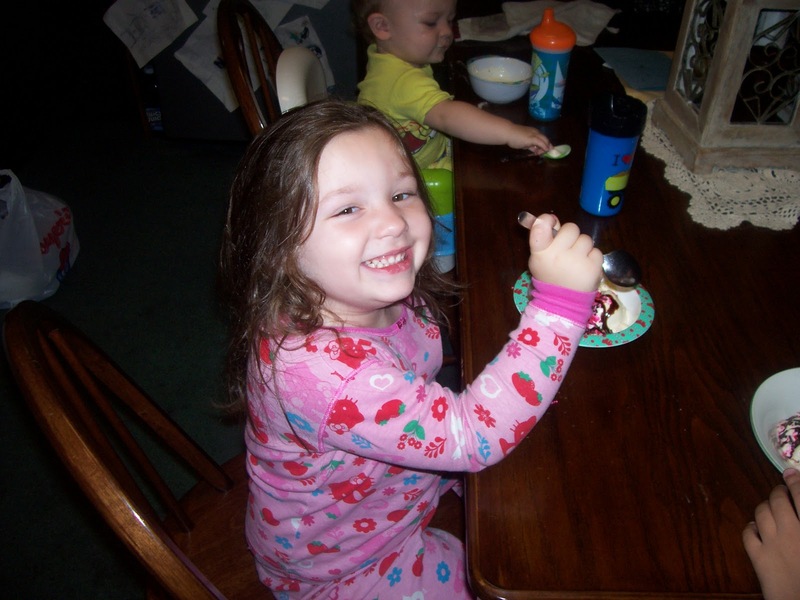 She is a sugar fanatic, (another reason this is a once in a week treat), but she loves to share a bowl of this ice cream with her favorite person, her daddy! He introduced the kids to this flavor, and this is what I buy at Boyers Food Markets, every weekend. Which brings me to my review. I am not a fan of ice cream. i do like the cookie dough pieces, and i do like the price of Edy's ice cream. Plus, there are always coupons for this product and Boyers will often have a sale, either 2 for $6 or buy one get one free! I do eat this once in a while, and I do have to say, i get hungry for this particular brand and flavor at times. This has never happened to me before, lol, because I simply am not an ice cream fan. Call me wierd, and I am ok with that! I'm also not a french fry fan, lol, that may make you think I am even more wierd. My kids think I am very strange because of this. The only other ice cream I have ever loved, was Turkey Hill Chocolate Peanut Butter, but even then, I would usually just eat the hard peanut butter stuff out, and leave the ice cream. But with Edy's, I actually do like the creamy vanilla part, as Aaron says. The Nestle part is my very favorite part, and I also love the Nestle cookie dough that you can buy that is already cut into little squares. I was recently informed of how wonderful these coffeemakers were, and I have been reading up on them, researching them, reading reviews, asking friends and family members, and I am hoping to get some of my online friends comments and suggestions on these products! I have had the same coffeemaker for years, I love it, but it's time for a new one. Although, keeping a small coffeepot around, might still work, since coffee runs through my veins! I hope it really doesn't but I would not be shocked if that would be on my medical file! I found this real neat site, http://www.onecupconnection.com/, where they sell these Keurig brewers, and offer an excellent variety of products. My husband was like "Oh yeah! I definately would love to have one of those! Those are awesome!" he is a coffee drinker to, thanks to me I think, but he also likes to have 1 cup at a time throughout the day. Not a pot at a time, like me. We usually have coffee every morning, and coffee after dinner each night. he normally has to be in bed fairly early during the week, due to his work schedule, so, the 1 cup part really is a big plus for us! The other very big plus that I have found, is the amount of different coffees available for these Keurig Brewers! There are so many to choose from and the varieties seem endless! This is also going to be a major factor in my. "Hmmmm, should miss can't bear to spend the extra money on something that I do not need at the moment, splurge on such an amazing coffee brewer?" When I say "splurge", you have to remember that I am the type who just will not pay full price for anything, no matter what it is. That is where amazon comes in handy for me, because, I can get good deals on DVD's and CD's, and books. For some reason, these things aren't real "cheap" where I live. I have been checking the site, http://www.onecupconnection.com/, for specials and deals, and i am very impressed with what they offer! They are having a sale right now, on the brewers themselves and if it weren't for the recent floods in my area, that caused my husbands work week to be cut terribly short the other week, I would be anxiously awaiting one of these to come via UPS!! Luckily, my house and town were not literally "flooded", some people did have damage, but for the most part, we are fine! It is every town around us that was affected quite severely, and this caused every single road, in and out of our small town, to be shut down for days. So, unfortunately, we are a little short this month, but I did pick up some extra days at work, and I am wondering, should I try to grab one of these brewers while the sale is on? The "frugal" "reasonable" me, says, "Wait and make sure you can afford to cover the missing income, and a few of the new expenses", and the "coffee lover" and "shopping addict" in me is saying, "Go ahead! You can grab one! Look at the sale prices! Imagine what it will be like to have 5 different cups of coffee at a time! Look at the variety! Check out the awesome deals www.onecupconnection.com, offers on the K-Cups! Buy 4 cases get 1 free! Now, that's a super offer! You have been checking this site for weeks, and they have always had specials on K-Cups! Not to mention, you can get hot tea and hot chocolate K-Cups for the brewer! Another plus for the kids......"
The site offers quite a good mix of products. From snacks, to sugar, to stirrers, to creamers, and paper products. Even boxes of wrapped straws! There is so much I would buy from them on a regular basis, and these things are very reasonably priced! They seem to always have something on sale. This week, they are offering free shipping, and 2 free cases of K-Cups, with the purchase of a Keurig B145 brewer, for $129.99. 42 K-Cups, the Keurig B145 brewer, and free shipping, for $129.99. That is actually, to me, a real great deal. I have to also stress that the website is very easy to navigate, and they offer a large assortment of snacks, and paper products, and K-Cups! They offer cases of name brand ( Quaker, Nestle, Healthy Choice, Nature Valley, Del Monte, Herrs, Utz, Bachman, just to name a few! ), products! I have seen sales on these over the past couple weeks as well. My favorite deal here is the case of ACT11 Butter Lovers popcorn, 28 full size bags, for $9.94! That makes each bag under 36 cents each! This website also offers free shipping on orders $60 or more! This is another big plus for me! i can order once per month, K-Cups, popcorn, those real cool wrapped up straws that my kids would love, lol, and a few other products, and take advantage of the free shipping! You have got to head over there though and look at the variety of brands and flavors that make these cute little K-Cups for the Keurig Brewers! Wolfgang Puck, Donut House, Newmans, Celestial Seasonings, Caribou! I have to say, I have never tried a lot of the flavors and brands, but this is another reason I am having a hard time putting this purchase off any longer! Flavors like, Kahlua, Irish Creme, Caramel Vanilla Nut, there are variety packs, almost every cup imaginable! I am more of a regular, darker roast person, but once in a while, I do like to try something new. I think I would have to buy the variety pack K-Cups for me, and I think my husband will probably stick with just regular, darker roast too. But who knows? with this much variety, and that many deals, it won't cost much to try a new flavor each month. They also have a blog, where they offer recipes with the K-Cups! You can find their blog here! It seems as though the Keurig Brewer has won my attention, and much respect! I will be ordering one as soon as finances calm down here at the Oliver household, and i will definately post pictures and my complete reviews!! Please leave any comments you may have on these Keurig Brewers! I would love to know what you think of this company? Do you own a Keurig Brewer? Do you have any recipes you used your Keurig Brewer for? If you don't own one, are you considering a purchase? What are your favorite flavors? Like One Cup Connection on Facebook for Deals and Specials and Promotions! You can also find them on Twitter!! I recently received a sample of this in the mail through a sample sign up at www.myloreal.com, and I had the chance to use it this past weekend! I often receive skin care samples in the mail, and I keep them in the bathroom, and I try a new one each week. Especially if there is enough for more then application! So, I used my little packet of Loreal Youth Code day/night cream, and I have been shocked ever since! I have to say I am currently in love with this product, and I plan on making a purchase, as soon as I check the drugstore deals for the week. I have tried and used so many products over the years, and I can't remember ever, ever having the same results that the company or model or even some magazines, will tell you they had. I never believe these testimonials, or claims and I have long since stopped buying products, solely because of what a super model, or a magazine editor said. I don't believe them, and I think they were either paid, or they were looking in a fun house mirror! But, you have got to believe me when I say that this Youth Code cream, DID in fact, provide instant results!! I know, this is silly, but I can't stress enough how amazing and addicting this day/night cream is! I was pleased with the simple opening of the sample packet, and the light texture of the cream. There was a good amount that I was able to have enough for almost the entire weekend. (Both day and night) I applied it just like normal, and right in front of the mirror, before my eyes, i could see it was actually working! My face was instantly smoother looking, flushed cheeks, looked more polished, and much more even toned, and the scent was luxurious! I was so ecstatic, I ran out of the bathroom to grab my cell and text my mom and yelled for my husband! Yes, we stay in a cabin with the kids when we go camping, although we love real camping, it's not always appropriate with our smaller kids. I texted my mom about my new "love affair", and she answered, "What? What is it?" , and of course, my husband laughed at me, but then proceeded to grab the sample and use it for his eyes. He has dark circles under his eyes, due to not getting much sleep, due to medical and job issues. LOL! I was upset thinking he would use it all before I had a chance to use it again! So, i tried to grab it, (this stuff is like gold to me), and luckily there was still some left, thank God! This product actually made it a terribly hard decision on whether I wanted to wear make up or not. i am already not a big make up person. I have a certain way I wear it, and I am very committed to certain products, but I was so in love with my skin this weekend, I didn't want to ruin it with makeup. But I do have to say, foundation, and concealer goes on so much easier, and smoother, over this Youth Code cream! I am offering a few coupon insert giveaways through my Facebook page, and my blogs. My other blog is www.momscrazyday.com. The next way to earn entries is to comment here or on www.momscrazyday.com, on my post with the same title as this one. 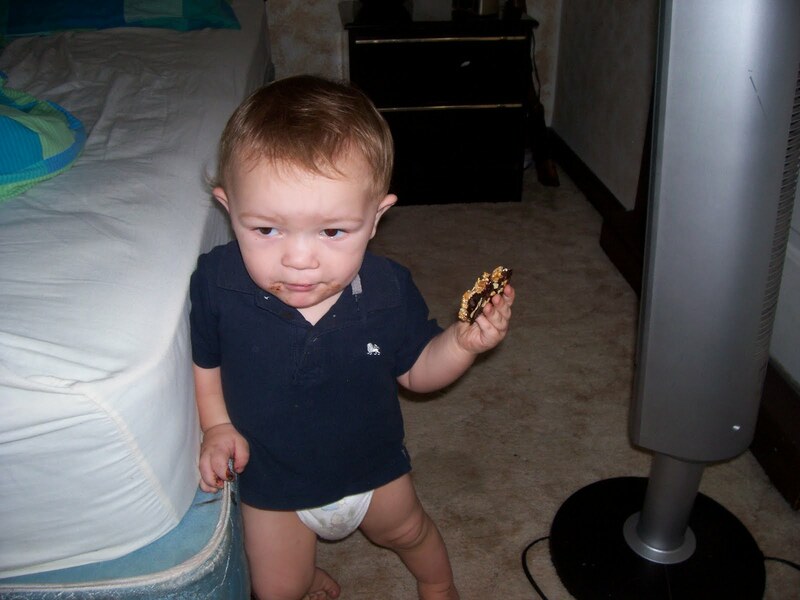 This is Deegan, my 1 year old, lol, just getting "trouble" for hiding in my room and getting chocolate all over my sheets from his Kashi bar, that yes, he knows how to open somehow on his own! He is crazy for Kashi products to, lol, especially these bars. I am so addicted to almost all the food Kashi makes! I absolutely go crazy when I run out of certain products, Salsa flavored Pita Crisps, Sea Salt pita Crisps, Peanutty Dark Chocolate layered Granola Bars, and Cinnamon Harvest cereal, oh! and the blueberry and strawberry cereals! Ok! Maybe ALL Kashi cereal! lol! I am a "Mom Ambassador" for http://www.greenmomsmeet.com/, and I was super lucky to be chosen for a Kashi sampling! I love this site and I recommend this to anybody, blogger, moms, leaders of moms groups, they really have awesome offers, and are very up to date with all things green and organic! I received my Kashi kit, and a box of these Soft Baked Strawberry bars was right on top. Well, I love Kashi, and I love strawberries, so I ripped it open and ate one and now I'm getting my shopping list ready for our weekend camping trip, and these bars MUST come along! I have to find a store that has a few boxes on the shelf, I'm thinking Walmart, so I will be running there Thursday afternoon. Kashi is all organic, all natural, and most of their products only has 4 or 5 ingredients! That alone is amazing! No preservatives, no fake stuff, just pure, healthy, very tasty, ingredients. I am a big time couponer, and price and availability of coupons are very important to me. I have to say, I have found some stores that carry Kashi items for a good price, some a bit more. So I don't hold this against Kashi, and I also understand that there are times when "You get what you pay for", is an honest rule to go by when purchasing anything. Even food. I have been purchasing Kashi products at Walmart, Boyer's, Giants, and Weis, and I also took advantage of a sale that CVS had when they offered Kashi products, buy 1 get 1 free, a few weeks ago. love these products, and doesn't have the Internet, (yes, they are still out there), you can give them this number to call and request some coupons! I also have been seeing a lot of Kashi printables online, and when the next round come about, i will link them here for you! Kashi is also a company that I know cares about what I eat, and most importantly, what my kids eat, and I have a few kids here who adore a lot of Kashi products! (even the cereals and bars). I consider them kid friendly, and that is sometimes all it takes to hold a special place in my heart! Well, I know. I said I was going to take a break from my blogs, but I had so much written and inside my head, that I planned on writing here today, that I have to at least add this. I got this tip from http://www.vocalpoint.com/ a few months ago, and I have been doing it ever since! To keep deli cheese fresh, add a sugarcube in the bag of cheese! Sounds a little strange, huh? I admit, I was kind of thrown off at first, thinking that the sugar would change the taste of the cheese. Well, it didn't. Matter of fact, it worked very well! We love, love, love cheese here, and there is nothing that gets me more aggravated, then bringing groceries home one day, and having some spoil, or start to spoil within a couple days. I do return things that are pricey, or that are absolutely out of date or just plain wrong. This does not happen often, I am a maniac when it comes to checking sell by and use by dates. I am actually pretty annoying with it. I'm that lady that will "gently" squeeze the bread and rolls, and dig and dig for the real fresh stuff all the way in the back! I always will nicely stack the loaves of bread for the next person though, lol. We also live a bit far from the stores I frequent, I guess any store for that matter. So, sometimes, returning an item that is still in date, but spoiled, would cost more to return then to just rebuy the product at a closer store. I am also quite picky with delis, and there is usually just one store, Boyers Markets, (I love them! I am very lucky to be near one, the sales are amazong! ), that I will order meat and deli items from. I also love a few local butcher shops! Anyway, even though Boyers has a super deli, there are times it seems that the cheese doesn't stay as fresh as long. I've been through this so many times with every other store, and I started to notice, the reason it ever happens at Boyers, is due to the deli sale case! When Clearfield american cheese is on sale, (our familys very favorite! ), the stores will have the display case with already presliced meats and cheeses. I often opt for fresh meat and cheese, rather then presliced. But the times I did not specify, is when I had that wierd white mold start around the edges of the cheese. Yes, I can and do cut it off, I mean it's cheese! But, ever since I have been placing a sugarcube inside the deli bag immediately after coming home, I have not had this problem! This works wonders! I am always fascinated when something so simple and small, can fix such a problem. I like to try and figure out, where did this idea come from? Was it an accident? Why does it work? I do not know, lol, but you have got to try it! All you need is one regular sugar cube! Thank goodness for this tip! Google is NOT Liking me Today! Well, since this is my review blog, I will complain about Blogger and Google here, lol. This is a constant struggle between Google and my blogs. 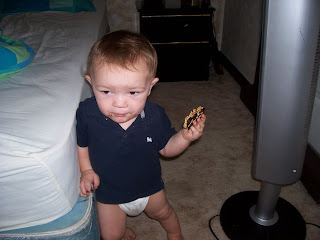 Thanks to http://www.mommyblogdesigns.com/, I got some huge help with my menu bar this morning. Even though I cannot attempt the complete menu bar makeover until Google decides to lighten up a bit! Now whenever I try to comment on my own comments, or comment on other blogs, it tells me I must log out and back in. Over and over and over again! I think I am going to take a break from trying to fill in my blogs today, I can't participate in bloghops today, nor can I participate in my http://www.voiceboks.com/ activities, again, today. It seems that every time I have any time to spend on my huge "Internet To Do list", Google is acting up and messing with me. Is it personal? lol, Please let up, Google! The weather here is very bad, we are flooded and there is nothing but rain and rain and more rain, over the next 5 days! The schools are letting out early, and already delaying tomorrow, and I can't really get my errands done today. I was looking forward to being able to cross a big chunk of this list off this evening! I have read so many good posts today, and wrote so many comments. My Google name appeared as I was writing them, and when I finish and try to submit, it pops up with a page that says I must log out of my account and log back in! So, that's what I do, then it happens again. I guess I'll work on a few reviews, my Youtube channel, and some housework today. If any of you know any secrets about Google, please comment below! Wish me luck in the flooding, I don't believe floods are covered under our homeowners insurance, of course. All I know is that our garage is flooded due to the township not taking care of their end of the issue out there, and our sump pump is on it's last days. Our house sits at the bottom of the hill, so all the water comes straight down to our house, and hmmmmmmm I have not heard the sump pump running for a good hour. My husband just informed me that I must get downstairs and make sure the motor is above water! Help me please, lol! I'm not a fan of the creepy sump pump room, or the giant drop to get to the bottom of that room, so I better find a super duper flashlight, and I better see that motor! I Messed Up My Neat Page Tabs! If you are here visiting today, I apologize in advance for the page tabs on my page! I finally had a few minutes to start filling in my blog, and I have a notebook filled with reviews to type in under each of these tabs, and I attempted to add a page for mu husband. Well, I have no clue what I did, but I emailed a professional to help me! With http://www.mommyblogdesigns.com/, Ro Littles' site, and reputation, this will be fixed soon. I noticed she is very busy over there, which is good, especially since her designs are fabulous! I left her a couple messages because I just noticed she has an "Ala Carte" section! This is going to come in handy for me because I always wanted some real cute buttons for Facebook and Twitter, and RSS!! I wish I had the money right now, cause i also need a design for another blog that I recently started!! After trying to figure it all in, lol, I may need to win the lotto! Possible Free John Freida Haircolor Coupon! There are a few questions you have to answer, and depending on your answers, you will either receive a coupon, or a voucher for free hair color from John Freida! It took me right to a page after these 3 questions, with a form to fill out for my free hair color voucher! It says to expect the voucher in 8 weeks, so that's when I'll be coloring with John Freida hair color! THIS LINK AND FREEVOUCHER ARE NO LONGER AVAILABLE!!!! If you still want the $1 off coupon, you can find the new link at the bottom of this page! Some of these may be expired, or only for new members, but it doesn't hurt to try them!! This super cute blog design you now see on my site, was done by Ro Little! She is a very talented and very amazing blogger, blog designer, and person. I have hbeen having several issues with Google in the past weeks, anything from missing posts, to being locked out of my account, to domain name dramas. But as I've posted in the past few days, I believe this is all behind me. I was most upset about not being able to log into my blogger accounts, not only because I couldn't post, but because i couldn't sit here and smile at my new blog style! I was fortunate to have signed up for http://www.mommyblogdesigns.com/, newsletters, and received a notice of an upcoming blog redesign giveaway, done by Ro Little. I have never won anything in my life, lol, always everybody's luck. But I was determined and dreaming that I would win this design. I entered on Ro's blog, and as always, was very pleased with her class, and talent. I would love to be able to be so artsy and technologically inclined, that i could create something like this. I am not that lucky though. lol. The days leading to the announcement, I was anxious, checking my inbox, double checking blogs, facebook, http://www.voiceboks.com/, it was driving me crazy! It would have been such a miracle that I would win this design, and I loved the cute little lady character that came with it. I have been spending a lot on my "business", and I couldn't figure out a date that I would be able to afford such a cool design. So, I waited and prayed some more. I already started thinking about the little badge/button that I always wanted for my blogs, and I was brainstorming ideas for my next blog redesign. Then all of a sudden, one morning I was on my Facebook page, www.facebook.com/Busymommylist, and I noticed a post by Ro on my wall! WOO HOO!!! I WON!! I was so ecstatic, and grabbed my cell to text my mom, my daughter, and my husband, lol. Yes, I believe my husband was probably going the most crazy during this event. He drives truck so he is not home very often, and I texted and texted and talked and talked about this real awesome design, this contest, how I have to have this for this blog, and so on. I'm sure he was very releived when he received my text, "I WON THAT AWESOME BLOG REDSIGN!!!" Ro was the sweetest, most dear, kindest, girl I've met through networking yet! She is so full of energy, and more then happy to work with you on your redesign. Not to mention, I've been saving every last blogger help email I've been receiving from her, with the most helpful information for all of our blogs! I plan on having a day to catch up after being locked out, and this is top of my list. It was much more simple then i thought the whole process would be, very easy, quick, and I just can't get enough of typing http://www.busymommylist.com/, in the address bar, just so I can see my blog! I have another blog that i am very excited about getting all filled in and fixed up, and I am will be ordering the redesign, through Ro little. She has already started some very cool designs, and layouts, and it will be hard to choose one. If you aren't a member of her site, please check out her work! She has very reasonable prices, specials, and is so much fun to work with! You are truly a tremendously talented girl! You have made me feel much better about my blog, and i will never be able to thank you enough! Affiliates, Youtube, Giveaways, and all I need to learn! I am now starting my next venture in the blogging world. It is time consuming for somebody like me, since I am still only about 6 months into this, and I have never had to learn these things before. This is not nearly as crazy as my episodes with Google the last couple weeks! Thank goodness that is all resolved! I already have email newsletters now, but through my Blogfrog account, I noticed that I am actually able to send these newsletters out for free! Not to mention, it is much less time consuming since I do not have to click through all of my contacts. I also noticed there are a few companies that are offering free trials for their email newsletter programs. I will be shopping around for a few weeks first, so if anybody has any suggestions, please comment and let me know! I hope that by next spring, I have a decent network built, and have learned the basics, and a little more, and I will be working on my 3rd blog at that time! This is a major goal for me, and I am nothing but determined to have this all figured out and squared away. Don't forget to "like" my page on Facebook, and find me on Twitter! I do have giveaways going all the time, and offer daily updates on freebies and deals. Thank you in advance for any advice on blogging, learning this stuff, and finding a reputable email newsletter host! Next month, or hopefully this month, I will be working on a Youtube channel, where we will do product reviews! By the end of this year, i hope to have my whole "Couponing 101" course, complete, and possibly offer a very cheap ebook as well. Other then affiliates, ebooks, Youtube, video reviews, my main task will always be NETWORKING!!! Which, by the way, I am looking for sponsors for my "1500 Facebook Fan Giveaway". 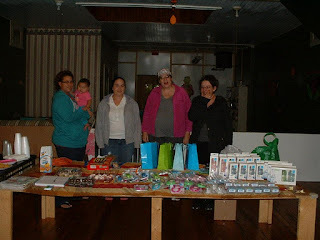 I am close to 1000 right now, and would like to partner up with some companies, SAHM businesses, any small business, who like to donate an item for this event, and your business, blog, pages, products, will aslo be posted all over my networks! This is one of our most favorite treats, I know it is very familiar to most of you, and may not seem so special, however, there are A lot of variations and ways to make this your own family tradition. I also like the homemade taste. I do, from time to time, purchase Chex Mix, I love the Bold flavor, while the kids really love Cheese flavored Chex Mix. But, there is just always something about homemade anything, especially snacks;p Plus, the time spent together is treasured more then any snack! 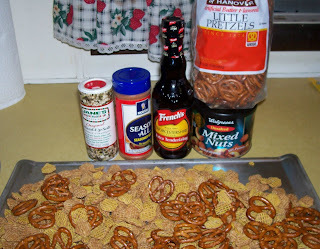 I set the oven at 250 degrees, while the kids wash their hands, then spread the Crispix cereal and pretzels on a baking sheet. We always add more Crispix then anything, since these are the pieces they all want more of lol. Then they add the nuts, by small handfuls, and stir around to check if more of anything is needed. meanwhile, I melt a stick of butter in the microwave, stirring halfway between, and adding worcestshire sauce. Next step is to pour the butter and worcestshire mixture over the cereal mix and toss to coat. A storage bag is also A big help, but at the same time, can end up being messier! Then it goes in the oven for 35 minutes, checking every 10 minutes, and tossing a bit more. You can also taste test and add more salt, garlic powder, whatever seasonings you decide to use! We use a spatula and pour the mix right into a Ziploc storage bag, zip the bag shut, and shake! The kids enjoy this part, and this also helps to evenly coat each piece. We do like to eat this warm, but it is very good once it sits for a bit and cools down! !